The terribly disturbing news that Leukaemia has finally beaten brave Jarrod Lyle came yesterday on his Instagram page in what was termed a "final post". 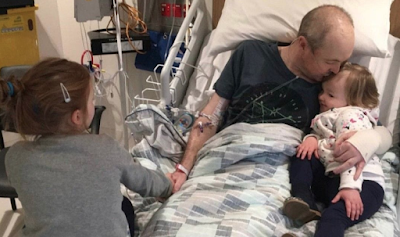 Jarrod Lyle hugs his two girls in his hospital bed. Since then Lyle's lifelong friend Evan Gale has set up a donation page to help the Lyle family with expenses at this difficult time. Tripp Isenhour has set a GoFundMe page for Jarrod's girls. The PGA Tour have also set up a YouCaring Page for the family. A statement on the page was posted by Jarrod's wife Bri. Like all who have cancer, Jarrod Lyle has battled so bravely and during periods of remission still provided us with some magical moments on the golf course such as this hole in one on the 16th at Phoenix in 2011. Wishing you peace on your journey Jarrod.